Choking remains the fourth leading cause of accidental death worldwide. Despite major medical advances in other areas, there currently are no devices that exist to assist in the resuscitation of a choking victim when the standard abdominal thrusts and backblows fail. The Lifevac is a portable, non-powered suction device that was created for the resuscitation of a choking victim when standard protocol fails. It is noninvasive and simple to use, thus making it attractive for use in choking emergencies. This article describes results of worldwide experience using the Lifevac in real life emergencies. Thus far the unit has been used successfully 100% of the time with limited to no side effects reported. The use of LifeVac has huge potential to save thousands of people from choking, including more susceptible populations such as children and the elderly. It can be used by EMS in the field, and the device could prove valuable in hospitals, nursing homes, day care centers, and other settings. Based on these encouraging results the Lifevac device should be considered as an option during a choking emergency when standard protocol fails. Choking is a leading cause of accidental death throughout the world. According to the American Red Cross more than 3,000 people die each year in the United States alone as a result of choking , and according to Injury Facts 2016, choking is the fourth leading cause of unintentional death . At highest risk of choking are the extremes of age: of the 4,864 people who died from choking in 2013, 2,751 were older than 75 . In addition, choking is a leading cause of death among children, especially those under 4 years old . Worldwide, a child dies every five days from choking on food. Choking is also a leading cause of brain injury in young children. When food or other small objects obstruct the airway, oxygen deprivation for just a few minutes may result in brain damage . More than 17,000 children are treated in hospital emergency rooms for choking related injuries each year . Unfortunately, despite these grim statistics, no advances have been made in the resuscitation of a choking victim since back blows were added to the American Red Cross ACLS protocol . Recently however a new device called the Lifevac seems to show promise in assisting a choking victim when back blows or abdominal thrusts fail. To our knowledge, in the past no device had been shown to successfully resuscitate a choking victim. In a choking emergency, time is critical as it can take EMS more than six minutes to arrive on the scene. At this point brain damage is already occurring and after 8 to 10 min damage is irreversible . Therefore a device that is inexpensive, easy to use and readily available would be advantageous in such an emergency. The Lifevac is a portable, nonpowered suction device that was developed for this reason. The device consists of a plunger with a one-way valve such that when the plunger is depressed air is forced out the sides and not into the victim and when the plunger is pulled back negative pressure is generated to suction out the obstructing object. The Lifevac has been made available over the past several years worldwide. We herein report the successful use of Lifevac in ten cases that have been reported to date. Lifevac has previously been reported to be successful in removing a lodged object in both simulator  and cadaver  models. Lifevac is marketed in Europe with a class 1 CE mark, and the kit comes with contact information such that if the device is used feedback can be provided. Case No. 1-3: The incidents took place at an assisted living home in Wales. An 80 year-old female with dementia was eating lunch when suddenly she was noticed to be choking by the nursing home staff. Back slaps were attempted twice but with no result and the patient began losing consciousness. A nurse on duty then used the unit according to package directions and with one application the food bolus was successfully removed from the patient’s airway. The patient recovered without any adverse sequelae. One week later the same patient had a similar choking episode and once again the Lifevac was successfully used to resuscitate the patient. In the same care home several months later, a 70 year-old male with Parkinson’s was noted to be choking while eating. The Lifevac was used per instructions and the obstructing food was successfully suctioned to the mouth where the nurse could then finger sweep it out. Case No. 4: Another case of a life saved using LifeVac occurred on September 7, 2015 in New Jersey. The patient, a female, was 31 years old and is wheelchair bound. The patient suffers from dysphagia, or difficulty swallowing, since a young age. She began to choke on her tuna sandwich while eating lunch. Her mother unsuccessfully patient supine, the Lifevac successfully removed the obstructing food. Case No. 5: On April 23, 2017 in Idaho, Lifevac was used in a private home. The device was bought for children who have had choking episodes. On April 23, it was used on a guest to the home, a 60 year old female with no medical issues who choked on a piece of meat during dinner. Abdominal thrusts were attempted right away, but unsuccessfully. The patient was the placed supine on her back on the floor. The LifeVac was then applied and with one suction, the piece of meat was removed from the airway. No adverse effects were noted. Case No. 6: On September 6, 2017 in Spain in a Parkinson center, there was yet another life saved using LifeVac. The patient was an 80-yearold male who choked on meat while eating. A nurse attended to the patient, giving 5 back blows followed by 5 abdominal compressions. When these were unsuccessful, she applied the LifeVac per operating instructions and with four applications the food was dislodged. Case No. 7: On October 4, 2017, LifeVac was used in a New York assisted living facility. The patient was an elderly male in a wheelchair who choked while eating a sandwich. The attendants were unable to perform abdominal thrusts due to his wheelchair status and instead used the LifeVac right away, which cleared the full airway blockage and dislodged the food. Later, a medical exam was performed including x-rays, which showed no adverse effects. Case No. 8: On October 31, 2017 in Greece, the patient was a 40-year-old female who choked on a piece of garlic. EMS was called and arrived two minutes later. The emergency personnel performed abdominal thrusts as well as back blows but they were unsuccessful. Four minutes later, an EMS rescuer used LifeVac and with 3 attempts, the garlic piece was removed. The patient’s vital signs were all normal, and again no adverse events were reported. In addition the EMS team had a body camera and the entire resuscitation was captured on video. Case No. 9: LifeVac was used on a 70 year old female with Huntingtons disease in a home care facility in the UK who choked on a sandwich during mealtime and become unconscious. The Lifevac was then used and required three pulls and the sandwich piece was successfully removed and was observed in the mask. The person operating the device was the 63 year old care manager. The patient briefly required CPR and was brought to the hospital where no adverse effects were reported and the patient was able to be returned to the home the next day. Case No. 10: Lifevac was used successfully was in the United Kingdom where the patient was a 68-year-old male with Down’s syndrome in a wheelchair who weighs 54 kg. The patient began choking on a piece of chocolate. A layperson saved the patient with 2 pumps of LifeVac and removed the obstruction successfully. Again no adverse events were reported. Choking emergencies constitute a common, potentially preventable cause of accidental death throughout the world. Despite medical advances, there are currently no devices that have been shown to successfully resuscitate a choking victim if abdominal thrusts and back blows fail. Lifevac has been previously reported to successfully remove an object from the airway in both a cadaver and a simulator model. Unfortunately it is extremely difficult to study this device in live humans and there is no animal model suitable for study. The Lifevac is a lightweight, portable, non-powered suction device Figure 1 that is applied to the patient’s face via a face mask, which comes with the unit in adult and pediatric sizes. A patent pending one-way valve on the plunger generates negative pressure. On downward thrust of the plunger, air is forced out the sides of the device and not into the victim (Figure 2). This avoids the possibility of pushing an obstructing object further into the airway. A negative pressure is then generated by pulling up on the plunger (Figure 1), thus removing the object. Since the device does not require placement of any part into the oropharynx there is no risk of pushing a lodged object further into the airway. Risks can include edema and bruising from the generated suction, but the benefit of saving a life clearly outweighs these small risks. It is interesting to note that the case reports were voluntary in their submission but represent populations at known risk for choking. There were no reports of the use of the device where it was unsuccessful. 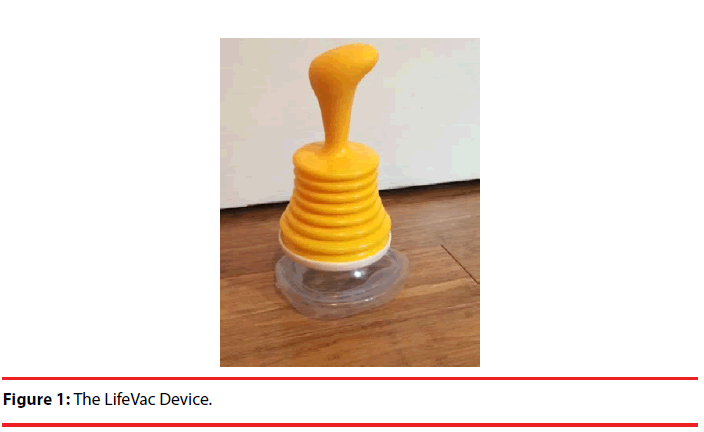 Based on the successful application of the LifeVac in real life situations described in this report, the Lifevac should be available for use in settings with high risk for choking such as nursing homes and day care centers, and possibly all public eating facilities. In addition it would be beneficial for EMS to carry for use in the field. Lifevac may be a viable option in a choking emergency when standard protocol fails. Figure 1: The LifeVac Device. Figure 2: Easy Technique using LifeVac. Choking prevention and rescue tips. Choking National Safety Council 31 (2016). Lam B. Choking is a leading cause of injury and death among children. Science Daily (2010). Heimlich Maneuver. Encylcopedia of Children’s Health. "Choking” Symptoms, Definition, Description, Demographics, Causes and Symptoms, Diagnosis, Treatment. 31 (2016). Choking: First Aid: Mayo Clinic, Mayo Foundation for Medical Education and Research.12 (10), (2017). Singh N, Sharma G, Mishra V, et al. Hypoxia Inducible Factor-1: Its Potential Role in Cerebral Ischemia. Cell. Mol. Neurobiol 32(4), 491-507 (2012). Lih-Brody L, Singer M, Brody Jr. E. Lifevac: A Novel Apparatus to Resuscitate a Choking Victim. Am. J. Gastroenterol 110: S695 (2015). Juliano M, Domingo R, Mooney MS, et al. Assessment of the LifeVac, an anti-choking device, on a human cadaver with complete airway obstruction. Am. J. Emerg. Med 34(8), 1673-1674 (2016).